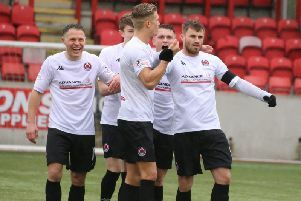 Cumbernauld Colts showed they are quickly adapting to life in the Lowland League as they hammered last season’s Challenge Cup winners on their own ground. Colts travelled to Lochburn Park full of confidence, having registered their first league win at Stirling in midweek after two narrow home defeat. They almost made the breakthrough after just 12 minutes as Andy Selkirk raced onto a wonderful Richard Kirwan through ball, drove away from the BSC central defender and drilled inches wide of Ian Stewart’s left-hand post with the ’keeper beaten. Selkirk threatened again on 30 minutes when he raced through on the right but his shot was blocked. From the resulting corner Stephen O’Neill picked out Alan Benton at the back post, but his header too was blocked. The match remained goalless at the break but half-time substitute Ian McIntyre made an immediate impact in the 46th minute by putting Colts ahead with his first touch. O’Neill beat two men to drive into the box and when his cross was fumbled McIntyre drove low into the net for his first goal for the club. It was nearly two four minutes later after a piece of individual brilliance from O’Neill who tricked his way past a defender inside the area and unleashed an unstoppable which left the ’keeper helpless but crashed off a post. Colts extended their lead after 70 minutes when McIntyre found Selkirk inside the area and he drove the ball across for O’Neill to bundle over the line. It was 3-0 on 81 minutes when Kirwan scored a wonderful solo goal. The Colts full-back picked up the ball just inside his own half and dribbled past five BSC players, running half the park to slot into the bottom left hand corner of the net with his right foot, for a superb solo effort. But the Cumbernauld side hadn’t finished and there was still time for them to add a fourth when substitute Johnathan Black opened his account for the club as he fired first time with his right from a low cross past the keeper to make it 4-0 with another excellent finish.